Spur blight is caused by the fungus Didymella applanata. Spur blight occurs only on red and purple raspberries. Spur blight has been considered to be a serious disease of red raspberry; however, recent studies in Scotland suggest that spur blight actually does little damage to the cane. The extent of damage caused by spur blight in the United States is not clearly understood. The spur blight fungus has been reported to reduce yields in several ways. It can blight the fruit bearing spurs that are produced on the side branches, cause premature leaf drop, and kill buds on the canes that later develop into fruit bearing side branches. In addition, berries produced on diseased canes may be dry, small, and seedy. Figure 1. Typical symptoms of spur blight on red raspberry canes. The symptoms first appear on young first-year primocanes in late spring or early summer. 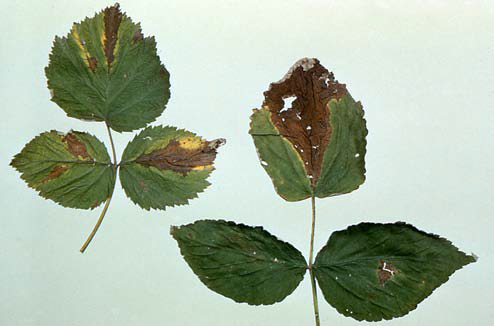 Purple to brown areas (lesions) appear just below the leaf or bud, usually on the lower portion of the stem. These lesions expand, sometimes covering all the area between two leaves. In late summer or early fall, bark in the affected area splits lengthwise and small black specks, which are fungal fruiting bodies (pycnidia) appear in the lesions. They are followed shortly by many slightly larger, black, erupting spots; another form of fungal fruiting body (perithecia). Leaflets sometimes become infected and show brown, wedge-shaped diseased areas, with the widest portion of the wedge toward the tip of the leaf. Infected leaflets may fall off, leaving only petioles without leaf blades attached to the cane. When diseased canes become fruiting floricanes during the next season, the side branches growing from diseased buds are often weak and withered. Spur blight is caused by the fungus Didymella applanata. 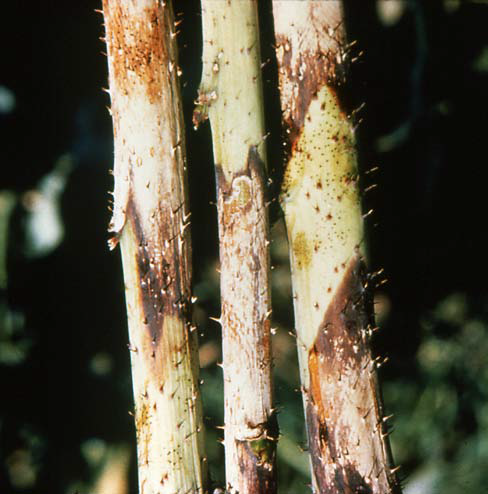 It survives the winter in lesions on diseased canes. The following spring and summer, during wet and rainy periods, spores are released and carried by splashing rain and wind to nearby primocanes. There they germinate in the presence of water and produce new infections, where the fungus will again over winter. Figure 2. Spur blight symptoms on red raspberry leaves. Wild brambles, especially wild red raspberries, growing in the area should be removed. They can serve as a reservoir for the disease. After harvest, remove and destroy all old fruited floricanes and any first-year primocanes that are infected. The best time to remove old and infected canes is after the canes go dormant in early winter or early spring before new primocanes emerge. If spur blight becomes an important problem in the planting, growers may want to consider the use of fungicide. Special fungicide sprays specifically for control of spur blight are generally not warranted. For the most current spray recommendations, commercial growers are referred to Bulletin 506, Midwest Fruit Pest Management Guide, and backyard growers are referred to Bulletin 780, Controlling Diseases and Insects in Home Fruit Plantings. These publications can be obtained from your county Extension office or the CFAES Publications online bookstore at estore.osu-extension.org. Figure 3. 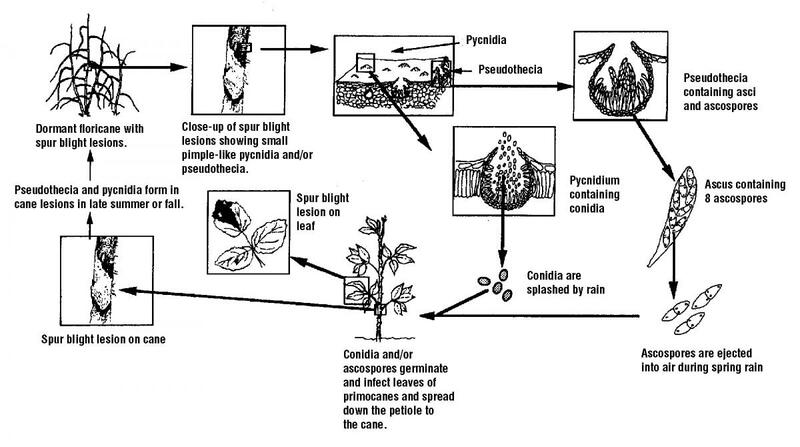 Disease cycle of spur blight.